Over the past few weeks, we’ve talked about how to set up your book in stores–from using Amazon’s KDP to Smashwords to which type of ISBN to choose when publishing the print version of the book. Now, it’s time to move into some release strategies. First up: Preorders and picking release dates. If you publish a book without building awareness early, you’ll be playing catch up. Depending on your distributer, you may have some limitations on when and how you can set up preorders. CreateSpace does not offer them at all, so if you’re looking to have your print books available early, you might consider IngramSpark instead. Amazon Kindle Direct only allows preorders up to 90 days in advance. 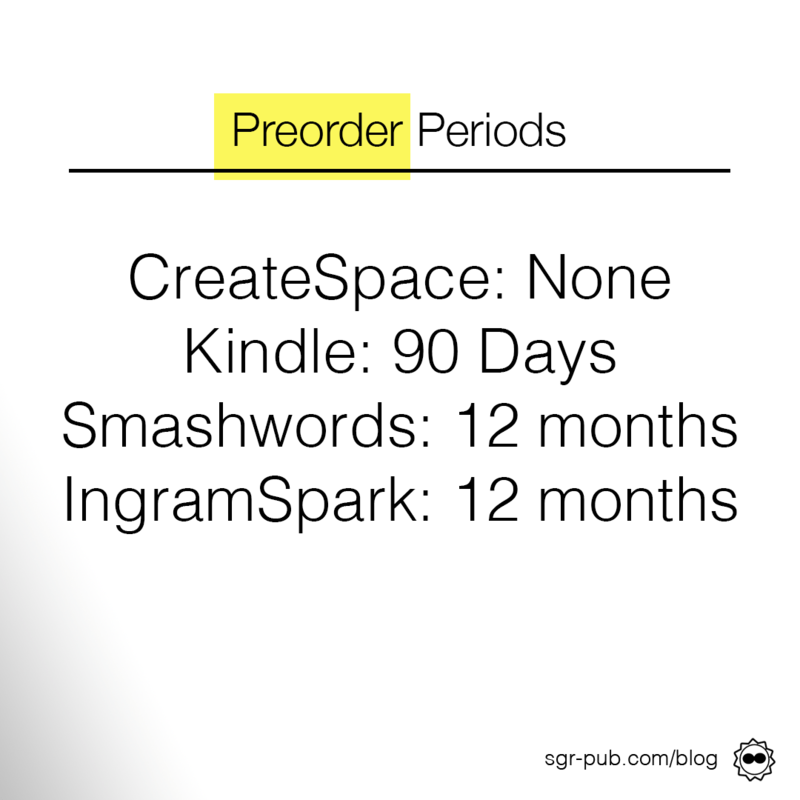 Smashwords and IngramSpark, on the other hand, offer 12 months advance preorders. Smashwords doesn’t even require you to have a manuscript, simply the metadata. (Ingram does require a manuscript). When should you set up your preorders, then? We like to start the process around the same time we submit our manuscript for line editing. For our process, that means the manuscript is more or less the final length, which means we can start guesstimating cover wrap sizes. Just like publishing your book to Amazon doesn’t automatically result in sales, neither does setting your book for preorder result in preorders either. In both cases, you have to do the work to increase both awareness of your book and trust that it’s a book to be paid for. Since Amazon allows us to upload 90 days in advance, we generally call that the “Preorder Period,” and focus our efforts on raising awareness for a particular series. If we’re releasing the first in a brand new series, we’d actually recommend starting the awareness effort even earlier than 90 days, because you’ll be starting from scratch with your audience (yes, even if you have an established audience). Obviously, first you want to let your readers know that you have a book. Run a 1-2 day ad blitz using your newsletter, social media, and blog/website. Schedule regular, fresh content about your book, from teasers to behind-the-scenes blog posts to character aesthetics. Establish or check on your author page is ready on Amazon Central, and don’t forget to add the preorder book to your list of books (you’ll have to do that every time). Later on this year, we’ll have a more in-depth discussion on how to use social media for book-brand awareness.